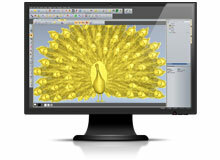 We will still be offering ArtCAM software training, - if you are looking for a CAD/CAM software please get in touch with us and we can offer a new solution. Το ArtCAM είναι μία ολοκληρωμένη λύση για τον σχεδιασμό και κατασκευή καλλιτεχνικών προϊόντων όπως επιγραφές, νομίσματα, κοσμήματα κ.α. Παρέχει τη μοναδική δυνατότητα δημιουργίας τρισδιάστατου μοντέλου από μία εικόνα ενώ περιλαμβάνει εργαλεία για την δημιουργία καλλιτεχνικών μοτίβων κ.α.. Εκτός των σχεδιαστικών δυνατοτήτων ενσωματώνει και εργαλεία για την κατεργασία των αντικειμένων από εργαλειομηχανές CNC. Our affordable entry-level product is very easy to use and contains a variety of 2D design and 2D/3D machining features. The perfect option for any new router owner; you can also add more features to your software as you need them. 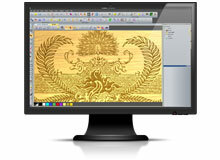 Extending the functionality of ArtCAM Express, ArtCAM Insignia features An expanded toolkit specifically for Repeat Designs in a production environment and introductory 3D design tools. 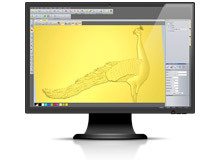 Our Professional Software Package gives you the power to design and manufacture 3D models or 3D sculpted reliefs quickly and easily. 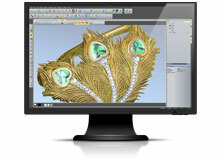 Combining the 3D Relief Modelling Power of ArtCAM Pro With Extensive Specific Jewellery Tools and Libraries allows you to create highly custom personalized jewellery pieces through to new complete lines.